Let this be my shortest post. The painting is by Isaac Levitan and the music, Tchaikovsky‘s. Choirs are Russian or Bulgarian. Isaac Ilyich Levitan (30 August 1860 – 4 August 1900: aged 40) was one of Alexei Savrasov‘s (1830 – 1897) students. Savrasov created the “lyrical landscape.” As for Levitan, he aimed to produce “mood landscapes,” a form of “lyrical” landscapes. Levitan was born in Lithuania, now Russia. He was the son of Elyashiv Levitan, and the grandson of a rabbi. In 1870, the Levitan family moved to Moscow and, three years later, Isaac entered the Moscow School of Painting, Sculpture and Architecture. Levitan’s mother died in 1875 and his father fell ill and died two years later, in 1877. Levitan’s family was then impoverished. Impoverishment did not prevent 17-year-old Levitan from attending school. He was awarded a scholarhip. His teachers were Alexei Savrasov, Vasily Perov and Vasily Polenov. Isaac Levitan’s paintings soon proved favourites in group exhibitions and, in 1880, famous philanthropist and art collector Pavel Mikhailovich Tretyakov, the founder of the Tretyakov Gallery, purchased Levitan’s Autum Day, Sokolniki, shown below. Russian Jews were the victims of pogroms, massacres. So Levitan had to leave Moscow when Alexander Soloviev attempted to assassinate Tsar Alexander II, in May 1879. The failed attempt triggered a “mass deportation” of Jews living in Russia’s larger cities. 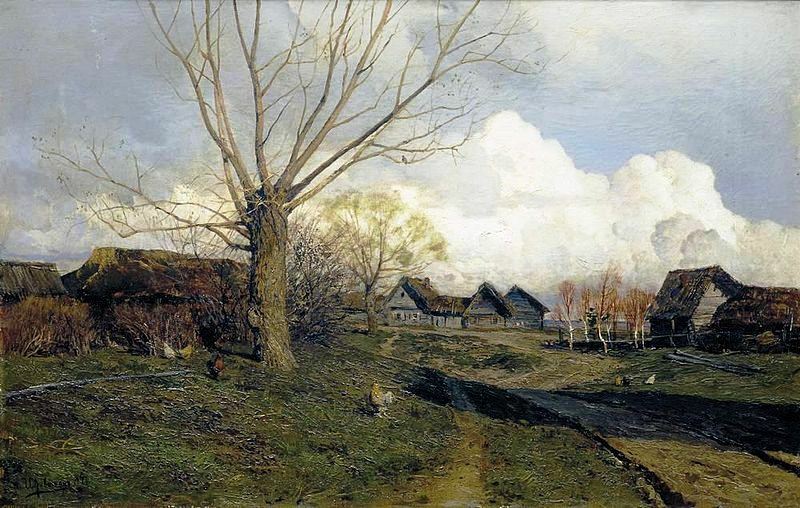 Levitan’s family left for Saltykovka, a suburb. 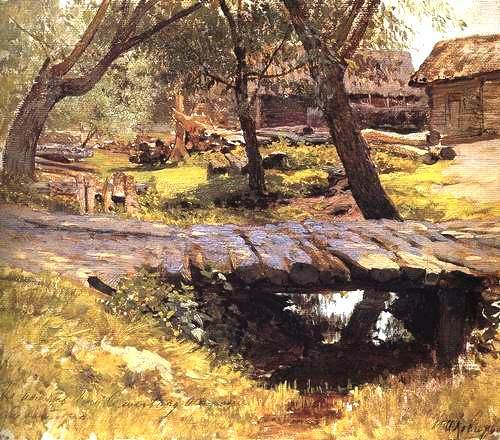 (See Isaac Levitan, Wiki2.org.) Levitan was soon returned to cities. In 1898, two years before his death, Levitan, then famous, would be elected to the Imperial Academy of Arts. Levitan and Anton Chekhov became very close friends. Isaac Levitan spent his last year and died at Anton Chekhov’s home in Yalta, Crimea. Anton was a medical doctor who died of tuberculosis in 1902, two years after Levitan’s death. We have seen that Russian musicians composed programmatic” music or music that told a story: words and music. Savrasov’s “lyrical” landscapes and Levitan’s “mood” landscapes were an attempt to unite painting and poetry. A discussion of Isaac Levitan differs, to a rather large extent, from a dicussion of The Five. 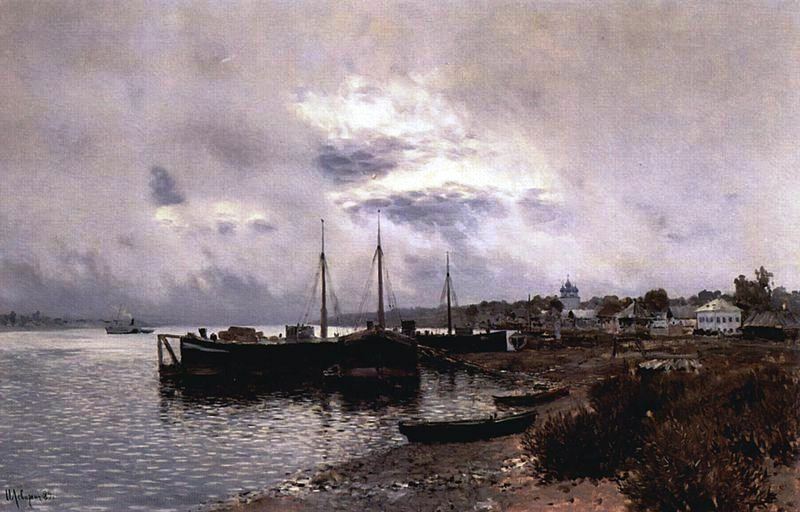 Although Pavel Tretiakov wanted to create a Russian Art Gallery and members of the Peredvizhniki painted the Russian landscape, they did not attempt, at least not primarily, to give their art an Eastern appearance. Orientalism pervades 19th-century art, but in Russia, Orientalism was expressed by composers mainly. I suspect, however, that Russian communities of artists and writers would include composers. All were creative minds. Ilya Repin portrayed the Slavic composers, meeting at the Moscow Conservatory. As for “mood” and “lyrical landscapes,” these could stimulate more than one sense, as in synesthesia, but they could simply be evocative and melancholic. Romanticism was an important movement. Vanishing points, are a common feature in the visual arts. But when roads and lanes vanish into the distance, we know not where they lead. At the end of Rachmaninoff’s All-night Vigil, Vespers, 🎶 one can hear a basso profondo or profundo. This vocal range is more common in Russia and Eastern Europe than in most countries. 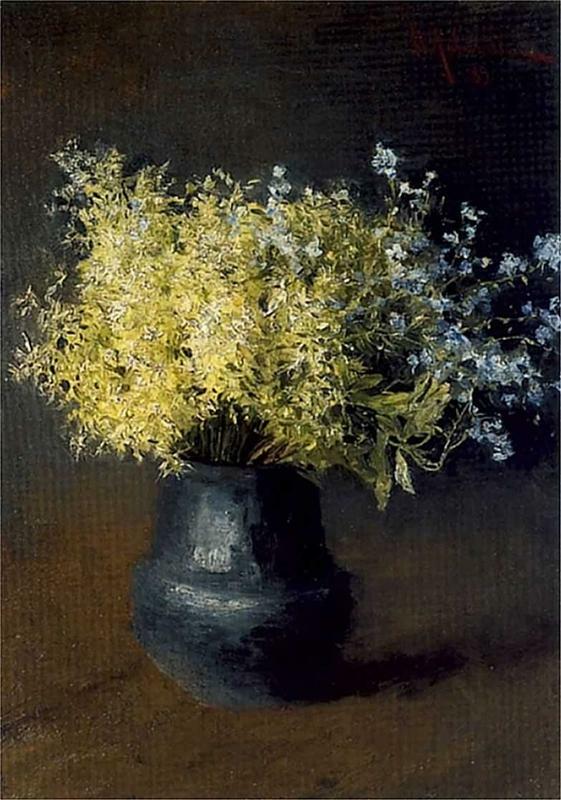 We associate artist Isaac Ilyich Levitan (30 August 1860 – 4 August 1900: aged 40) with mood or lyrical landscapes, but he also left lovely paintings featuring flowers. I am very tired and must rest, but I am thinking of you. However, those who turned to the “worship of Bacchus” did not necessarily become alcoholics. Mussorgsky did, and it led to his death. Repin‘s portrait of Mussorgsky, the eyes in particular, is one of his finest paintings. We have already seen two paintings by Isaac Levitan’s (August 30, 1860 – August 4 1900). 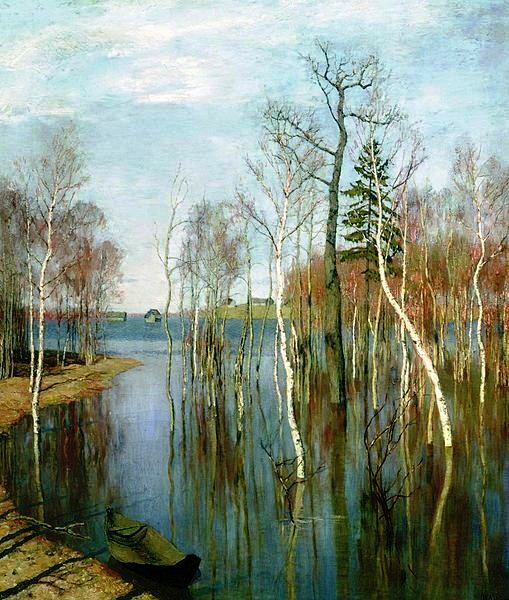 Isaac Levitan, a Jew, was a Lithuanian-Russian artist and he created the “mood landscape,” lyrical landscape paintings. Levitan was associated with the Peredvizhniki (wanderers), a group of artists who sought more freedom than was allowed by academic art. 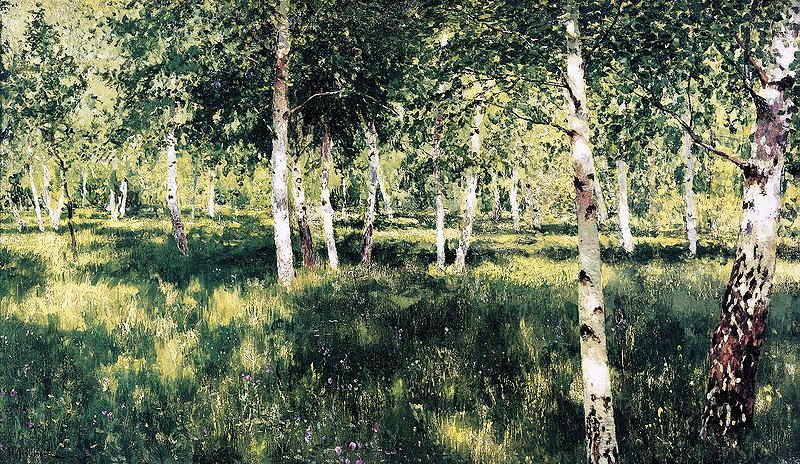 Levitan was a friend of Nikolai Chekhov, a painter, and also befriended Nikolai’s brother, Anton Chekhov. Nikolai had died of tuberculosis in 1889 and, as mentioned in earlier posts, Levitan spent the last year of his life at Anton Chekhov’s house, in Crimea. Levitan died of a terminal illness at the age of forty. Anton, a medical doctor, died of tubercolusis in 1894. The above painting reminds me of Canada where birch trees are plentiful. You probably remember from our voyageurs blogs that canoes were made of birch. If one was destroyed, voyageurs and Amerindians could build a new one quickly by helping themselves to what birch trees provided. Nails were not used in building canoes.